Can You guess the names of the dogs in this image below? In the early 70's Branko and Frieda decided they wanted a smaller, versatile hunting dog, that could be kept in the house. 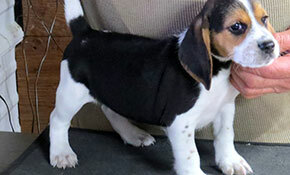 After much consideration and looking at a lot of dogs, the beagle was decided upon. 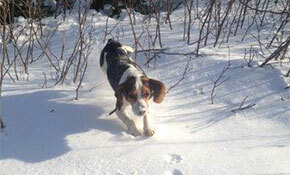 However, after researching the breed, not very many hunting beagles were to be found. The majority were show dogs only. Then we were lucky and found someone with a pack of hounds, that were actively hunted over and the first puppy was purchased: Jimmy's Giocoso, i.e. “Rea”. She turned out to be a wonderful dog, lots of hunt and desire, probably a bit too much mouth in hindsight. Rea was not only gunned over, she was also shown, and was only points away from being a show champion. However, she ran in the Ray Yearwood Memorial trial at the Oshawa Beagle Club on Saturday, and was shown in Barrie, Ontario the next day. The show judge berated us for the dog not having been clipped and the dog having scratched up ears. And that was the end of our showing beagles. However, we were hooked. 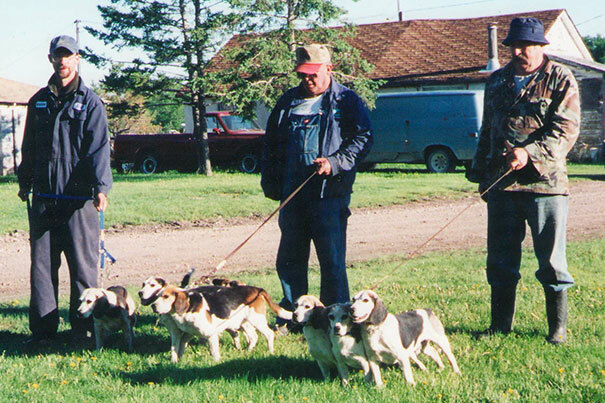 We had met by then Geoff Montgomery and Terry McBride and others of the Oshawa Beagle Club and became members, and are members to this day. Rea was bred to Terry's Ft. Ch. Winterborne Boomerang who was probably one of the best dogs we've seen. Good pups came out of this and they still show in some of the pedigrees today. One of them went to Armando Pazienza, his first registered beagle, Branko's Queen of Diamonds. By then one single beagle wouldn't do, of course, and slowly a pack was created. Anna's Ann was purchased from Geoff Montgomery. Anna's Ann is the one dog you will find way back in each and every pedigree in our kennel. She was an outstanding dog in her own right, and she would produce excellent dogs, no matter which sire was used. This was around 1973. The trial bug had bitten us and we attended many a trial in Ontario in those days. We sure value the relationships forged at that time and the friendships resulting from it. Anna's Ann was also bred to Winterborne Boomerang and produced our favourite dog ever, Branko's Conman. Conman was 1/8th – ¼ of an inch too tall, and was only trialled 2x. We just couldn't allow ourselves to try to consistently trial a dog that was oversized. However, we knew how good of a hound he was, and so did everyone who ever saw him run. Conman sired some awfully good dogs, Branko's Pretty Pebbles and Branko's Double Ann. Again, those 2 names can be found in a lot of pedigrees. Pretty Pebbles' sister was given to Armando Pazienza and she in turn produced a lot of good dogs for him. This was Branko's Flying Spark, 3x winner of Top Female Producer of the year by Better Beagling. In 1977 we decided to go West. We packed up all our belongings, had 2 kids by then, and started farming at our present homestead in St. Laurent, Manitoba. The dogs of course went right along. The only problem was, we no longer had the yardstick of trials to see how our dogs compared to others. We had to breed to our own standard, guided by the CKC rule book. One day a pack of females was running, when a blizzard came upon us very, very quickly. The dogs were stuck in the storm. We live quite far out, and there was no way of telling where they'd wind up. Once the storm subsided, horses were saddled, and Branko and a friend went looking for the dogs. They found some frozen to death, but also found where one dog had slept on top of one of the dead ones, then left when the snowing stopped. They followed her tracks and found Anna's Ann. Another couple of hours later and she would have died also had she not been found. Branko tucked her into his jacket and brought her home. She stayed in the house by the woodstove for quite a while. Unfortunately some of her teats had frozen off. However, after she recovered she came into heat. We wanted to breed her, but to which stud? After much consideration and phoning around, arrangements were made with Bob Nicoll to ship her to Boston from Winnipeg, to get bred to F.C. Dingus McRae. This turned out to be a very wise decision. Realize though that in those early days of farming each penny was turned over 2x before it was spent. Finances were tight but, as we always tell others, breed to and buy the best you can afford. When Ann had her pups, our youngest son Marko was just born. Since Ann didn't have the teats to feed the pups, Frieda would get up to feed Marko, Branko would get up to feed the pups. After a couple of weeks all was well. This litter produced: Int. Ft. Ch. Branko's White Blizzard, Branko's City Streaker, Ft. Ch. Branko's Close Call Girl, Branko's Manitoba Man, and Branko's Misty. Ft. Ch. Branko's Close Call Girl is the dam to Ft. Ch. Branko's Jack of All Trades. Good breeding, and reproducing breeding doesn't happen by accident. By then, some of the dogs we had sold as pups were starting to win trials, and the demand for pups was increasing. Since we didn't want to just produce pups, rather concentrate on breeding excellent dogs, the size of the kennel grew slowly. We are often asked how many champions we have produced, and I can honestly not answer that one. I have a tall stack of championship papers in frames (never hung out) of champion dogs we owned ourselves, but just never have kept track of the ones we sold. If truth be told, the piece of paper or the trophy really isn't what it is all about anyhow. We don't have any trophies in the house. Our greatest satisfaction comes from getting a newly minted champion home, and running it with its own pen mates. When we see that the champion is the same as the rest, we know we've done a good job. Another feeling of accomplishment comes from the fact that those who have bought dogs from us over the years, keep coming back. We had a call a few years back from a family in Pennsylvania. The parents had a son of around 14 years old, starting to hang out at the mall, getting in with the wrong crowd, but he did like hunting and liked dogs. The Dad bought a couple of pups from us to try and get the son to go hunting with him. A year or so later I received a letter from the Mom, thanking us for saving their son. Not only did he go into the woods with the dogs, the relationship between father and son had improved totally and they were now the best of buddies. Just wanted to give you an update on our Dexter. He’s doing great and growing up fast. It’s amazing how big he has gotten compared to the day we brought him home. He’s got lots of energy and is very social. He loves kids and all people really. He has some dog cousins that he gets to visit as well. That’s always fun. Now he’s just over 4 months old. He just got his rabies shot last week and is proudly wearing his new collar tag. Here’s a few pictures of our happy pup for you and Branko, including his first trip to the lake and his first time swimming! We hope both of you are keeping well. Bye for now.